Last night MPs in parliament voted on Theresa May's EU withdrawal deal. The vote was a shattering defeat for the government, who lost by 230 votes - a record defeat for a motion proposed by a sitting government. Just 3 Labour MPs voted with the government, and 118 Conservative MPs voted against their party's government. 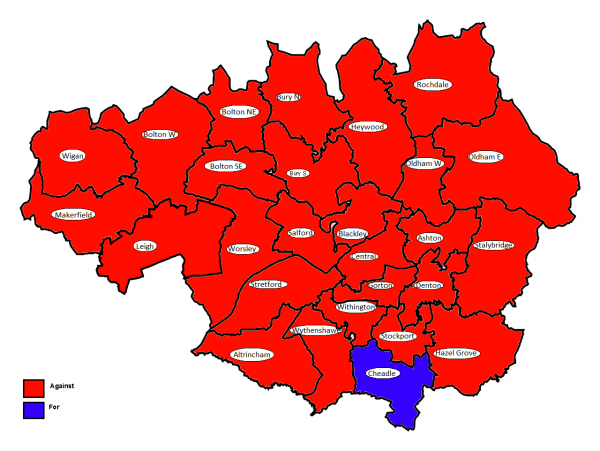 The table below outlines how each of the MPs in Greater Manchester voted - their names are coloured according to their party - Red for Labour, blue for the Conservatives and grey for independents. As you can see, only one MP in Greater Manchester voted for the deal - Mary Robinson, the Tory MP for Cheadle. All other MPs voted against, showing that May's deal is more or less universally disliked across our city. I promised an infographic, but given the scale of unanimity across the city, the map below is a little on the nose at proving the point the deal was unpopular. Labour leader Jeremy Corbyn has tabled a motion of no confidence in the government today. If it passes, it's likely that Labour will call a general election. However, political experts think the motion will not pass and Theresa May's government will be allowed to continue. In that scenario, May has until Friday to come back with a response on what the government is going to do next regarding Brexit. There are several possibilities. She could seek further concessions and reassurances from the EU, but the reaction of the bloc's leaders last night would suggest they are not willing to budge on the deal they have already set out. Theresa May could set out a motion for a second referendum in an attempt to gain the public's support for her deal. Whether this would pass the house is unknown and depends on the question of such a referendum. Would it be a choice between May's deal or no deal, or a choice between those two options and remain, or simply a rerun of the 2016 referendum? Each option has its critics. If unwilling to do that, May could ask for an extension to Article 50 to keep the country as it is while staging a complete renegotiation of her deal. Or in more extreme moves, May could revoke Article 50, thereby cancelling Brexit, or at the other end of the spectrum she could let the UK leave the EU without a deal in place by the end of March. Threatening either of these moves would be a last ditch attempt by the PM to try to gain support for her deal as being the least worst alternative. Of course, with the chaotic nature of parliament at the moment, something entirely unexpected and random could occur. All we can do is watch and wait.